Copyright © 2011 by Toonwerks. Blip.tv has essentially replaced actual TV in my life now. It’s got channels I can surf, shows I actually want to watch, and content that’s far more varied and creative than what you might see on most networks. The majority of what I watch on Blip are Channel Awesome shows like “The Nostalgia Critic” and “Atop The Fourth Wall,” but I’ve also discovered some lesser-known shows. 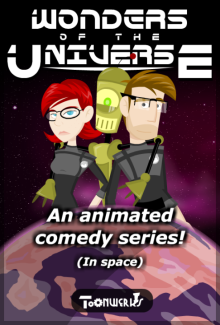 Like Wonders of the Universe, an animated comedy series set in the future of space! The luxury star cruiser Wonders of the Universe is the flagship of the White Dwarf Line and about to make its maiden voyage. Quentin Quasar is one of the billion humans employed as “sub-servants” to the non-human passengers and officers on the ship. He tries his best to do his job, despite his unrequited feelings for fellow human Nova Jones, the “help” of the ship’s computer STFU-9000, and the machinations of Major Canis. Quentin Quasar is the luckless protagonist and one of the few sane men onboard. His love interest is Nova Jones, who barely notices him, and his best friend (if you can call it that) is STFU-9000, a talking computer with access to every part of the ship, a talent for stating the obvious, and no sense of personal space. The alien officers of the ship are equally colorful (and not just in skin tone). Major Canis is a veteran soldier who’d rather be anywhere else except as second-in-command on a luxury cruise and who shows a distinct hostility toward Quentin after a failed plot to get off the ship. The captain is a sentient and boisterous goldfish named McKraken, while the person in charge of carrying him in his water bowl is a ditzy alien girl named Lin’zee Starshine. The animation in this series is surprisingly good. I say surprisingly because, while it uses a lot of Flash animation that’s easy to find on the Internet, there’s a lot of subtlety and passion put into this work. Whether it’s the majestic image of the titular ship or the “camera angle” on a conversation between Quentin and Canis, you can tell that the show has a lot of thought and effort put into it. When I watched (and rewatched) the first few episodes of this show, I couldn’t help but think of other sci-fi comedy like Red Dwarf and The Hitchhiker‘s Guide to the Galaxy. This, however, is probably deliberate (in fact, I’m sure that Quentin is humming the theme to Hitchhiker‘s Guide in the shower in Episode 2, which is also called “Mostly Harmless”). 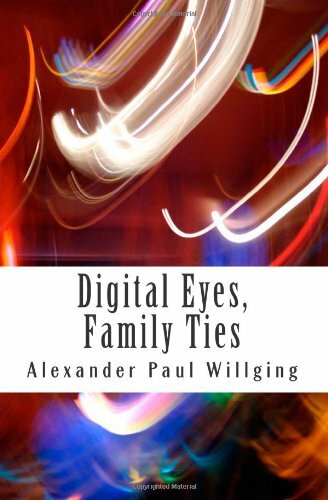 The writing is solid, the jokes are quick, and there’s some surprising heartfelt or dramatic moments interspersed. However, at the time of this writing, the show is still in its early development. There are only two episodes and one short feature on Blip.tv. More is still to come and I think this is one project that deserves some love. Bibliography: Wonders of the Universe. Directed by Mark Schneider. Written by Casey McDonald, Mark Schneider, Joseph Blanchette, and Chris Boe. Toonwerks, 2011.